The immersiveness of this Tu Bi’Shevat playlist and practice is a chance to find the softer, quieter parts of yourself at your own pace. This Tu Bi’Shevat playlist is an experiment in sensory observance and self-guided ritual. Inspired by the Hip Hop X Rosh Hashanah project, created by Rabbi Alex Kress, it is intended for self-paced reflection and private worship that extends beyond the usual rituals associated with this holiday. When creating this playlist, I was reminded of a memory from earlier this year. After breaking the fast on Yom Kippur, I ran into a Jewish friend on my walk home from synagogue. “Did you do anything for Yom Kippur?” I asked her. I was struck by this practice. This friend did not have a Jewish community near her that she connected with, and she did not belong to a synagogue. But she wanted to connect with God on the holiest day of the year, and to her, the most divine place she could find was not the overcrowded sanctuary of a synagogue, praying in a language she could not understand. She found a space that spoke to a deeper expression of spirituality within her: in the forest, wandering through trees and rocks, with the river winding beside her path. Although Jews often gather indoors, whether around the Shabbat dinner table or gathered before the bima at synagogue, we do have Jewish traditions of outdoor worship (such as the kabbalistic practice of praying outside). When it comes to celebrating Tu Bi’Shevat, there’s no need to forego community celebrations like seders and tree-planting rituals. But the “New Year of the Trees” is also a chance to sanctify yourself through a more intimate connection with nature and your senses. The immersiveness of this Tu Bi’Shevat playlist and practice is a chance to find the softer, quieter parts of yourself at your own pace. Listen to this playlist while walking through the woods—or desert, beach, park, or whatever natural place lies within your reach. Log on to Spotify if you already have an account, or create one for free if you don't, and open this playlist. Make sure you have water or thermos of tea--after all, water is sustaining to plants and people alike--and try to clear yourself of any other distractions. Make sure you are warm enough. Try to enter into this moment with a clear mind. 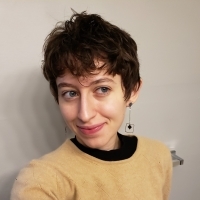 Shoshana Lovett-Graff helps to bridge the spaces between technology, spiritual practice and Jewish learning as the Innovation & Impact Program Associate at Reconstructing Judaism and Ritualwell. She writes and resides in Philadelphia, PA. Follow her work here.